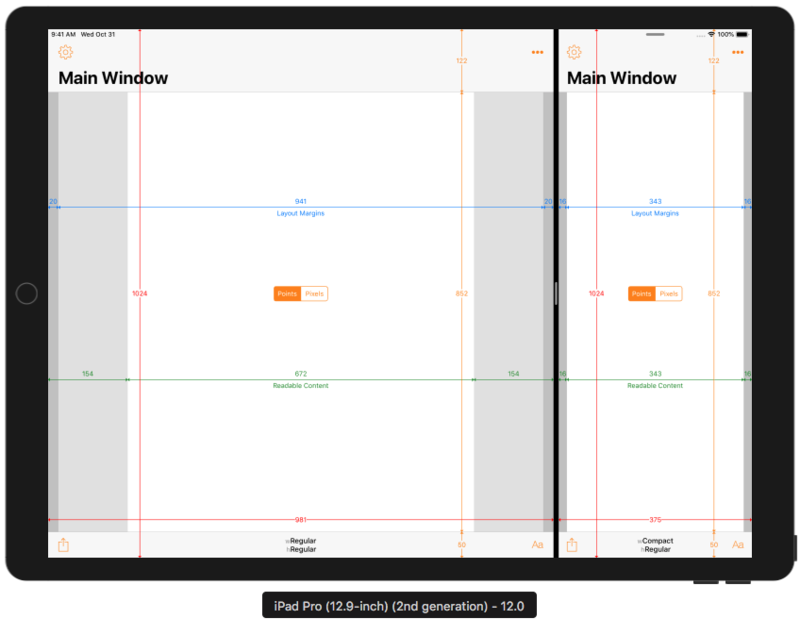 The new 12.9" iPad Pro has the same screen resolution as previous models in a smaller body, whilst the new 11" iPad Pro is a new screen size in a body very similar to the 10.5" iPad. Note that the 11" iPad Pro has the same height (in landscape) as the 10.5" iPad Pro but is 82 points (164 pixels) wider. I.e., it only changes size on the longer dimension. The status bar is 20 points (40 pixels) tall. If you weren’t aware, iOS 12.0 changed the heights of navigation bars, toolbars and tab bars on iPad for apps built with Xcode 10.0 and later. Apps that were built with Xcode 10.0 or earlier (i.e. targeting iOS 12.0 or earlier) are unaware of the existence of the new 11" iPad Pro screen size or a 12.9" iPad Pro with a Home Indicator (instead of a Home Button). From previous experience with older apps running on newer devices one might expect that Xcode 10.0-built apps would see the exact same screen resolution as the previous 10.5" and 12.9" iPads, and be scaled, pillar- or letter-boxed to fit the new screens and avoid the Home Indicator overlapping the app content. For the first time ever to my knowledge, that’s not what happens (except for apps that require full screen) 😲. iPad apps that do not support iPad multitasking (i.e. they have UIRequiresFullScreen set to YES in the Info.plist) will appear at their original 9.7" or 10.5" iPad resolution on the 11" iPad. 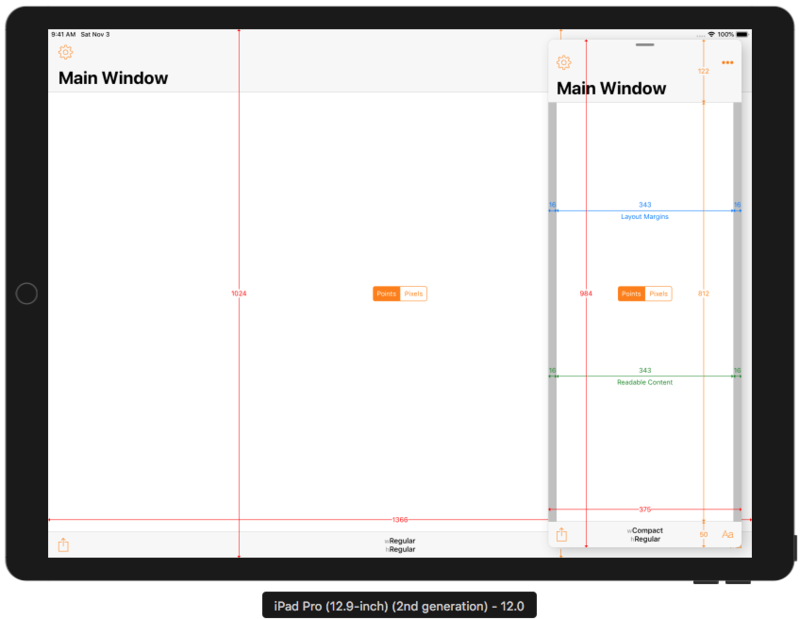 Which version is used depends on whether a 10.5" launch image or a launch storyboard (which opts into 10.5" iPad support) is present. 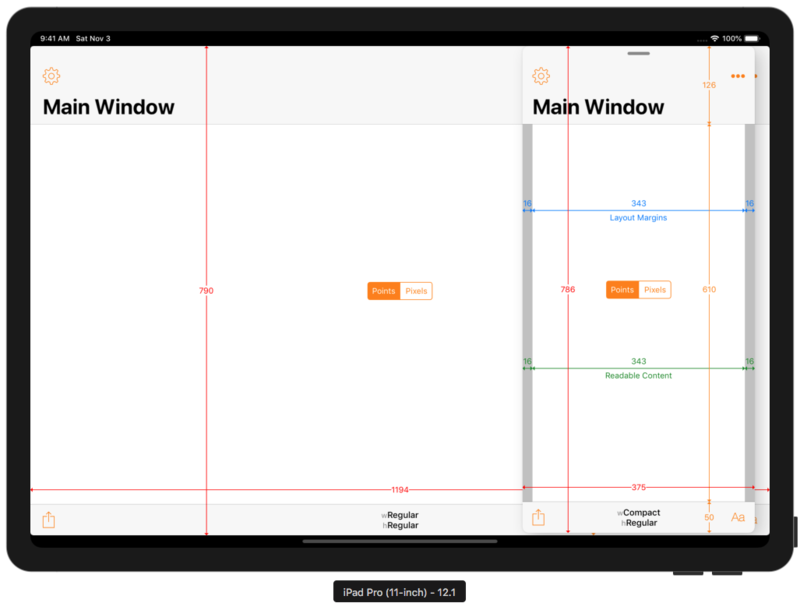 The apps are scaled to almost fill the screen of the 11" iPad. Similarly, the 1st and 2nd generation 12.9" iPad resolution is scaled to almost fill the screen on the 3rd generation 12.9" iPad. The status bar and Home Indicator are effectively outside of the screen area. In order to maintain a 4:3 aspect ratio, the app is also inset on the left and right edges. Of course, this will introduce some scaling artefacts. Instead of scaling to fit, older apps that do support multitasking (which effectively declares them as somewhat adaptive) appear in a Compatibility Mode with a screen size that doesn’t match earlier devices or the full size of the new devices. The status bar and Home Indicator are still outside of the screen area that the app occupies. Note also that the height of the large navigation bar has increased from 122 to 126 points (244 to 252 pixels). As we will see later, this is actually due to an increase in height of the status bar from 20 to 24 points (40 to 48 pixels) on these devices. This happens even though the status bar is not actually part of the app’s screen area in this special compatibility mode! Xcode 10.0-built apps running on the new devices see similar Safe Area behaviour as before, except that the status bar is 24 points rather than 20 points tall. The new iPads do not have leading/trailing safe area insets, in either orientation. With no notch and smaller rounded corners compared to the iPhones X the usual leading/trailing layout margins should be wide enough to avoid UI elements appearing too close to the corners. For example, the 10.5" iPad Pro without a navigation bar or toolbar has a top safe area inset of 24 points, even in compatibility mode where the status bar is outside the app’s screen area. In an uneven split, the narrow app is 375 points wide in landscape instead of the 320 points it has been on previous 9.7" and 10.5" iPads (i.e the same as on previous 12.9" iPads in landscape). In portrait, the narrower app remains 320 points wide on all iPads. Older apps running in Slide Over on the 11" iPad have a width of 375 points in landscape and 320 points in portrait. As with the iPad 10.5" reference, the height is two status bar heights shorter than the height of the screen. The status bar is 24 points tall on the 11" iPad so this means the Slide Over app on the 11" iPad is 8 points shorter than on the 10.5" iPad. As we’ve already seen, an old full screen app is inset by 24 points at the top to avoid the status bar and 20 points at the bottom to avoid the Home Indicator. This leads to a slightly awkward appearance where the Slide Over app is 4 points shorter than the old full screen app (they align at the top, but not the bottom). When built with Xcode 10.1 (i.e. linked against iOS 12.1), apps get access to the full 11" and 12.9" screen sizes of the new devices. In one of its new developer videos, Apple warn that both apps in split screen will be forced into compatibility mode if either of them have not been updated to support the new devices. So, even if you rebuild with Xcode 10.1, your app might find itself in a new screen size when paired with an older app. In a deviation from the norm, Apple have designed the new 11" and 12.9" iPads Pro to behave in an almost backwardly-compatible manner for multitasking-capable apps that were built with Xcode 10.0 or earlier. Older apps see full screen, split screen multitasking and Slide Over sizes which are unlike any previous or current device. Even apps that use auto layout and have launch storyboards will be shown in this compatibility mode. Apps that do not support multitasking (UIRequiresFullScreen is set to YES in the Info.plist) will retain their 10.9" or 10.5" effective resolution and be inset to avoid the status bar and Home Indiciator. 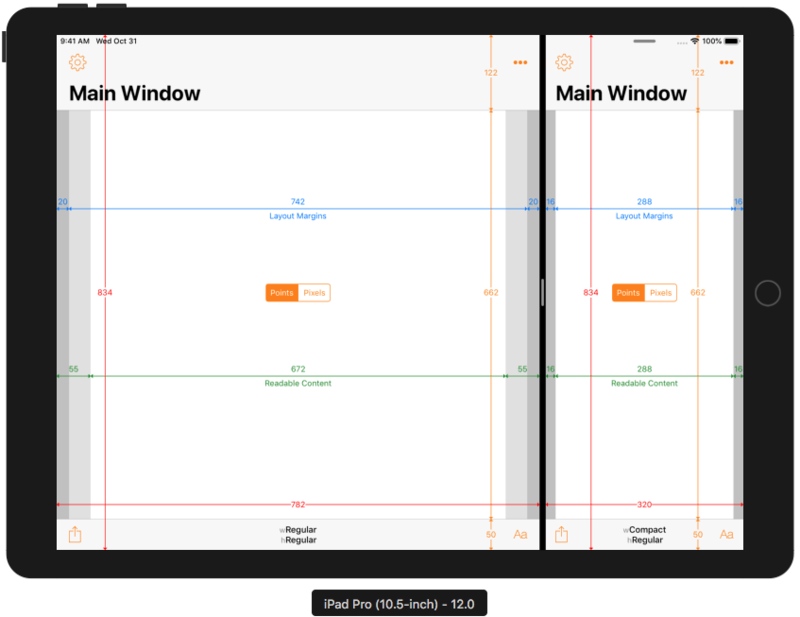 Apple have been warning developers not to make assumptions about bar sizes for several years. They have strongly recommended using the Safe Area for layout since iOS 11 and the iPhone X. Developers who heeded this advice should have little to no work to do. Their existing Xcode 10.0 builds will work (at a slightly unusual and never-before-seen resolution) on the newer devices. 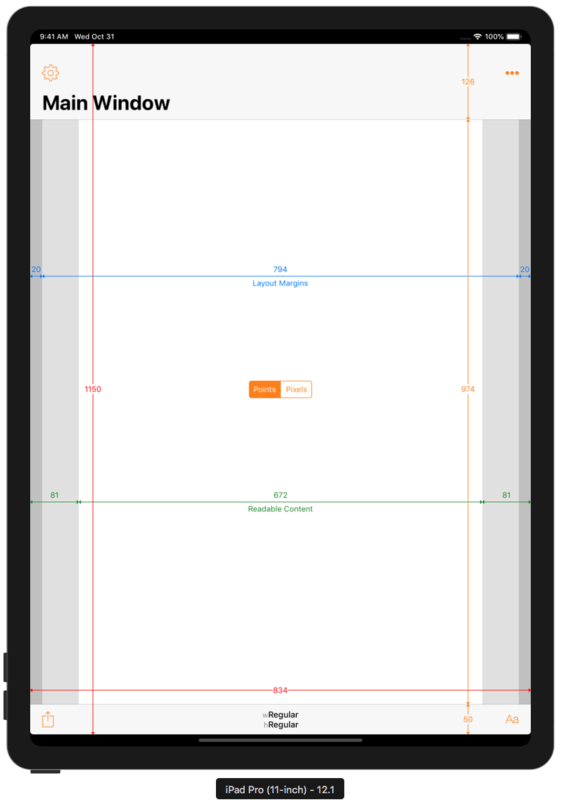 Rebuilding with Xcode 10.1 will take advantage of the full screen size of the new iPads and avoid the Home Indicator. That might be all they need to do. On the other hand, apps which aren’t adaptive, assume bar heights or screen sizes, are possibly going to have some layout problems. In a change from previous years and devices, running existing multitasking-capable apps on the new iPads will result in different behaviour. How Did I Run Xcode 10.0 / iOS 12.0 apps on iOS 12.1 Simulators? You might be wondering how I was able to capture screenshots from the Xcode 10.1 / iOS 12.1 simulators with apps built with Xcode 10.0. My earlier article iPad Navigation Bar and Toolbar Height Changes in iOS 12 explains the process in the Wait, What Did You Say? section. The screenshots in this article were taken from the iOS simulator running my Adaptivity iOS app. Adaptivity is a tool for developers and designers to visualise the different screen sizes, layout margins, readable content guides, bar heights and Dynamic Type sizes that a modern, adaptive, iOS app uses when running on different devices and iPad multitasking sizes. More screenshots and information on all the features is available on my web site. There is an iPhone-only version of Adaptivity to show How iPhone-only Apps Appear on iPad (it changed in iOS 12). I have also written about External Display Support on iOS and Working with Multiple Versions of Xcode. If you found any of these articles helpful then please take a look at my apps in the iOS App Store to see if there’s anything that you’d like to download (especially the paid ones 😀). If you work with a lot of Xcode projects you might like my Mac Menu Bar utility XcLauncher.